From China To The U.S.: Student Juggles Two Worlds The daughter of migrant workers from northeastern China, Mandy Lu goes to college in North Carolina. She says whenever she crosses the border between her two worlds, she feels like she's in a daze and she has to find an identity for herself in a place that's so familiar — yet not familiar at all. Mandy with her father (far left) and other relatives, on her recent trip back to China. Her parents think it's important for her to connect with her relatives, but she often feels like she doesn't have much to say around them. A couple of months ago, I went back to China for the first time since before I started college in the U.S. It was my first trip home in two years. When I saw my parents and grandmother at the airport, I felt awkward. I didn't really know what to say to them. Mandy, age 11, with her parents in the one-room apartment they shared with her grandmother in Beijing. The room was about the same size as her freshman double at college last year. The first thing my mother said to me is, "You're not fat." She always tells me I've gained weight when I talk to her over Skype. Whenever I cross the border between my two worlds, for the first few days, I feel like I'm in a daze. I have to find an identity for myself in a place that's so familiar and yet not familiar at all. And I'm all on my own whenever that happens, because no one around me knows my other world — or the kind of person I am in my other world. My parents are from northeastern China. They're migrant workers, living in Beijing. Financially, they're not very stable. They run a traditional medicine shop doing acupuncture and massage. They work seven days a week. I look at how hard their lives are, and I feel guilty that I can't help. It's hard for them to get a grip on what things are like for me. I don't think they know enough about America to have the capacity to understand certain things. Like how I don't eat steamed buns for breakfast at school. Or how I could disagree with my professor. Or why a dance party at college where everybody cross-dresses is fun. On my trip home, I spent a lot of time sitting around with family eating or just snacking on sunflower seeds. My parents think it's important for me to connect with my relatives. But I have almost nothing to say. Sometimes I wonder if I'm actually related to them. 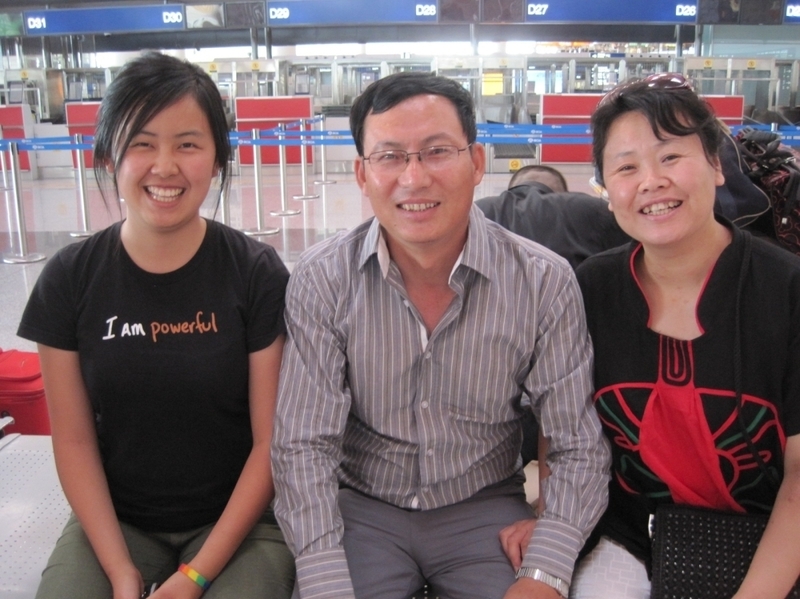 Mandy with her parents at the Beijing airport. As conversations at the dinner table would get louder and louder, I would have flashbacks to the racket my friends and I would make in the cafeteria over someone's silly trick with a straw, or the racket we'd make with test tubes and beakers in the chemistry lab. I found myself missing all of that. At the same time, seeing where my relatives live was a reminder of my roots. 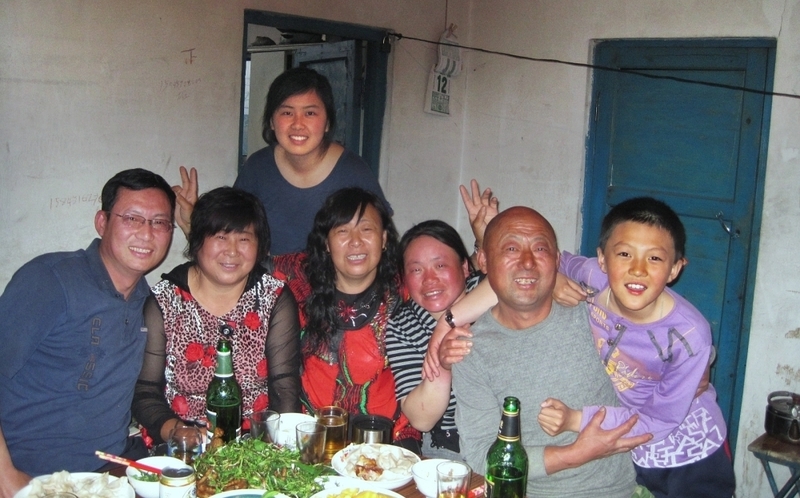 My aunts still live in a migrant workers' enclave on the outskirts of Beijing. It's chaotic and cramped, and fights are frequent. This past year at school, I lived in a standard freshman double. The room was about the size of the place where my whole family of three plus my grandmother used to live. Many of my college friends complained about our dorm. But for me, it felt like a really a safe and comfortable place to be. I have been back from my visit to China for two months now. I'm still debating whether I should put pictures from my trip on Facebook. Here in the U.S., I've been unconsciously only putting my "American" self out there. Maybe I'm afraid to show my differences. Or maybe I'm simply avoiding the many questions I know will come my way.